A layer of atoms near the surface of the earth in which living organism live is called troposphere. In this layer, 95% of air is found. The thickness of troposphere varies from 0-16 km. The upper boundary of the troposphere is called tropopause. Stratosphere is extended to 16-50 km. 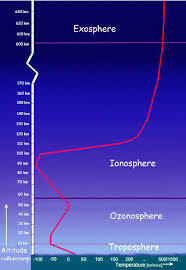 The atmosphere of the stratosphere is called Ozonosphere and in the stratosphererain does not occur. The temperature increases in thestratosphere due to absorption of ultra-violet rays. In thermosphere, radio waves are reflected and it is extended from 80-720 km. The temperature of thermosphere varies from -96Ëš to 1200ËšC. 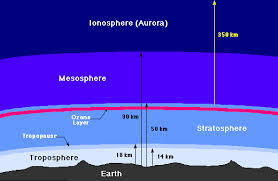 Thermosphere is also called ionosphere. 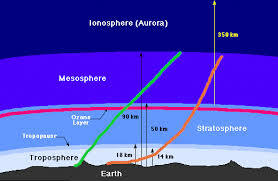 It is called ionosphere because ionization process occurs in ionosphere. The other name of exosphere is Fringe Region. The level of thickness of exosphere varies above 720 km and its temperature is 1200Ëš to 6000Ëš C. The exosphere is also known as helium zone. It is also known as helium zone due to abundance of helium. Layer of atomsphere near the surface of the Earth in which living organisms live is ______. How much percent of air is found in Troposphere layer? What do you call upper boundary of troposphere? 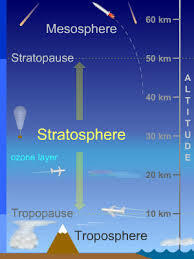 What do we call the atmosphere of stratosphere? At what level the thickness of mesosphere varies? What is the other name of exosphere? What is the temperature of exosphere? 1200 to 6000 degree celsius. Any Questions on 'Atmosphere of the Earth '?